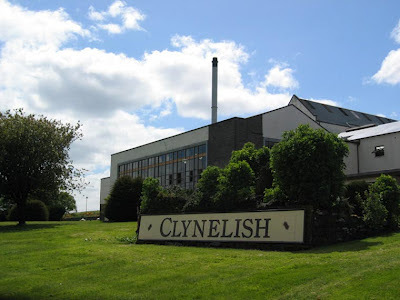 Clynelish is a somewhat less well-known member of the Diageo family of whisky distilleries, having recently been a part of their "Hidden Malts" collection of single malts that were previously rare or unavailable. In the case of Clynelish, much of this has to do with the tumultuous history of the distillery. It was established on the Dornoch Firth in 1819 to serve as a market for grain grown by the Duke of Sutherland's tenant farmers. Clynelish quickly built an extremely strong reputation during the 19th century. However, the distillery fell on hard times in 1931 and closed its doors. The distillery reopened briefly after 1938, but was once again shuttered amid the grain shortages of WWII. Reopening once again in the post-War years, the distillery was updated in the 1960s and a new distillery was built alongside the original in 1967, copying the old stills as closely as possible but installing a significantly greater number of stills to increase production capacity. The original distillery closed for a short time and was then renamed and operated as Brora starting in 1969. The old distillery began to make a more heavily peated whisky to fill a gap in the owner's portfolio as heavier Islay-style whiskies were an important component in their blends. This ended in 1983, at which point the old distillery was closed for good. The new distillery continued to operate under the Clynelish name, primarily producing whisky for the Johnnie Walker Gold Label blend. Single malt Clynelish bottlings were semi-available during the 1990s in the "Flauna and Flora" incarnation, but got a bigger push in 2002, releasing the now standard 14 Year bottling. This whisky really introduced me to the concept of maritime flavors in a single malt. While there are long, heated debates about whether or not whisky can really taste salty, my guess is that much like the way that a whisky can smell sweet even though there's no way for the nose to directly detect sugar (check out the first video around 2:30), there are flavors and smells in the whisky that the brain associates with saltiness, so it assumes that there must be actual NaCl present and fills in the perceived blank. But whatever it is, this whisky really reminds me of a seashore, with the salt tang and wet vegetation all swirling around. To me this whisky falls somewhere in between Arran 10 and Highland Park 12 in terms of peat. Much like the Arran the peat seems more vegetal than smoky, but unlike Arran, Clynelish does use a medium-peated barley malt. This makes it an excellent way to ease into peat-ier single malts without going all the way into heavier Island and Islay whiskies. In terms of sherry influence, Clynelish is much closer to the Arran than Highland Park. Though if you want to try a version with greater sherry influence, there is a Distiller's Edition, which is unfortunately seems to be difficult to find in the States. But the regular Clynelish 14 is still solid and usually runs somewhere between $45 and $55, which makes it a rather good value given its age and the quality of the whisky. 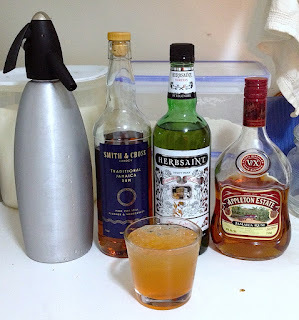 Recently Doug over at the Pegu Tiki Blog posted a review of various recipes for the Dr. Funk cocktail. This is in a sense one of the ur-tiki drinks, having been invented in the South Pacific long before Don Beach touched a bottle of rum. You should really go read the full history that Doug posted, which includes figures like Robert Lewis Stevenson and Paul Gauguin. However, it seems that none of the recipes available make for a really inspiring drink. Looking over the lists of ingredients, I could see that there should be a good drink somewhere among them, so I decided to tinker a bit. This was basically an attempt to split the difference between Don's version and Trader Vic's. The sip leads off with a tingle of soda water, followed closely by the Jamaican rum dunder funk. This segues into lime and sugar, which quickly transforms into a melange of Herbsaint anise and grenadine fruitiness, with just a hint of the soda water's carbonic acid. It took a couple of tries but I'm pleased with how this drink turned out. I was quite happy to find that the Smith & Cross/Appleton V/X combo did an excellent job of tying down the quarter ounce of Herbsaint. I was worried that it would overwhelm the drink, as six drops is usually enough for most of the drinks I enjoy that contain Herbsaint. The soda water helps to leaven the drink and its carbonic acid works to counterbalance the hefty doses of syrups. Go with half an ounce of soda water if you want a more spirit-forward drink and an ounce if you want a more fruit and anise-focused drink. I reviewed the younger 10 Year whisky from Arran a few months back, so now it's time for it's elder sibling. I got very lucky and was able to get my hands on these two whiskies for very reasonable prices because the state of Oregon has a bit of a glut of Arran and decided to heavily discount them. The 14 Year runs in the mid-70s most of the time, but has been available for only $50 for the last few months. Unfortunately that comes to an end on March 1st, so if this sounds like a scotch you'd like to try and you live in the NW, I'd suggest picking up a bottle sooner rather than later. 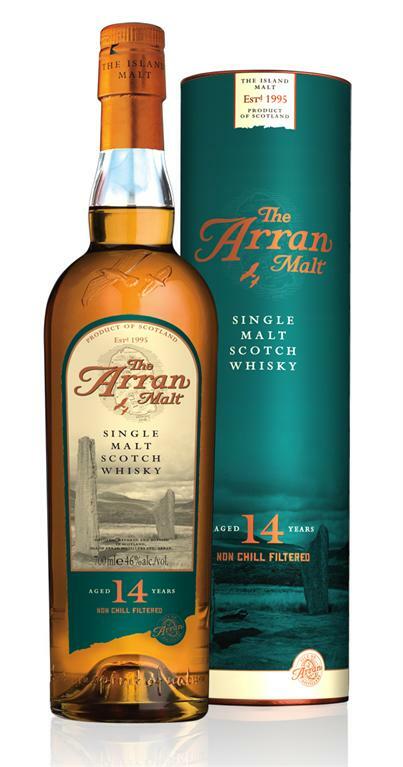 Like the 10 Year, the Arran 14 Year is bottled at 46% without chill filtration, giving is a decent amount of heft and a nice mouth feel. It's somewhat inconsequential, but I have to hand it to the people who do the packaging for Arran. The standing stone motif is a nice touch. It's a very good balance between showy and simple, which lets it stand out on the shelf without overreaching. Nicely done. This is a really excellent whisky. 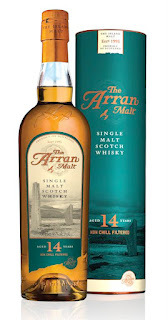 With that said, I think I actually like the Arran 10 Year a bit better. The 14 Year cranks up the sweetness of the 10 Year while losing some of the peat and other Island influence that provided such a nice balance in the 10. If you live in Oregon or can make it here by the end of the month, it's mostly going to be a matter of personal taste. There's only a $10 difference between the two expressions right now. But once March rolls around, the 10 Year will become a much better deal, especially if you order it online. Another set of provisional reviews, this time of two offerings from the Dalwhinnie distillery. I found this to be a decent, but somewhat uninspiring whisky. The nose is rather fruity and the vegetal peaty that pokes through in all stages of the drinking experience is nice, but it wasn't enough to make me want to go out and buy a bottle. With that said, it is rather reasonably priced for a 15 year old, coming in around $50-55. If I didn't already have a decent number of whiskies in the "light, vegetal peat over sherry" vein, I probably would go out and buy it. Much like the time I tried Oban 14, I drank this whisky at the wrong time. In this case it was after a dram of Aberlour A'Bunadh, which is obviously a rather hefty whisky. So again, there are probably subtleties that I missed due to my taste buds and nose having been retuned to cask strength. This is a fairly nice whisky, though other than the interesting gin note in the palate, I didn't feel like it brought much to the table that you can't find in the regular 15 year old Dalwhinnie, especially considering the extra $20-25 you'd have to shell out for a bottle. Yeah, I've missed out on a few MixMos lately, but there was no way I could skip this one. Doug over at The Pegu Tiki Blog has declared that in conjunction with Tiki month, it would also be the theme of this month's Mixology Monday. So I present to you further evidence that rum and tequila can play nice together. Combine all ingredients with a handful of cracked ice, blend for five seconds and pour unstrained into a chilled rocks glass with more cracked ice. This drink began as a fairly simple adaptation of the Three Dots and a Dash, as the vegetal flavors of tequila have some passing resemblance to those of rhum agricole. In this drink I went with Sauza Hornitos Añejo, which is a totally respectable and relatively inexpensive añejo tequila. It's not going to blow anyone away, but it toes a nice line between tequila funkiness and more subdued barrel flavors. With a nod towards Jim's Special, I subbed out the falernum for orgeat to help bridge the rum and tequila. Lastly, in keeping with the fact that this is a slightly lighter drink than the original, I went with El Dorado 5 Year rum rather than the heavier ED12 or Lemon Hart 80. ED5 is nice and fruity while retaining a lot of the classic Demerara rum flavors. The opening sip is surprisingly dry, with hints of orgeat nuttiness, leading into the fruity notes of the Demerara rum. This segues into a burst of lime and orange, followed by the spices of the Angostura bitters and allspice dram, then finishes with the vegetal agave flavors of the tequila. Amidst all of that, the honey works its magic to smooth everything out. In a sense, this opens like a rum drink, but finishes like a margarita. Once again, thanks to Doug for hosting this month and a good MxMo to all! Much like my Cask Strength Shootout post, these are provisional reviews, as I only tried these whiskies once. Still, they were large drams, so I got a fairly good sense of what was going on. It was a bit of a mistake for this to be the second whisky of the night after the Talisker. I have a feeling that this is a better and more complex scotch than it seemed at the time, but after the brawny island smoke, it just couldn't stand up. I'd really like to try more, but the price point is just a bit hard to justify when the somewhat similar Clynelish 14 is nearly $30 less. If anyone has a lead on a store that will sell and ship it to me for under $60 I'd love to try it again, but right now it's a little way down my 'to buy' list. This drink comes from the estimable Mai-Kai Polynesian restaurant in Fort Lauderdale, FL, one of the few remaining outposts of remaining from the heyday of tiki. Built in 1956, the Mai-Kai is a veritable temple to all things tiki, including 23 tons of Polynesian artifacts, five dining rooms and two cocktail lounges, all under a 40-foot tall concrete A-frame sculpted to look like enormous wooden beams. If I ever have a reason to go to Florida (and it'd probably need to be a pretty good reason given the heat and humidity), I would absolutely want to go to the Mai-Kai. 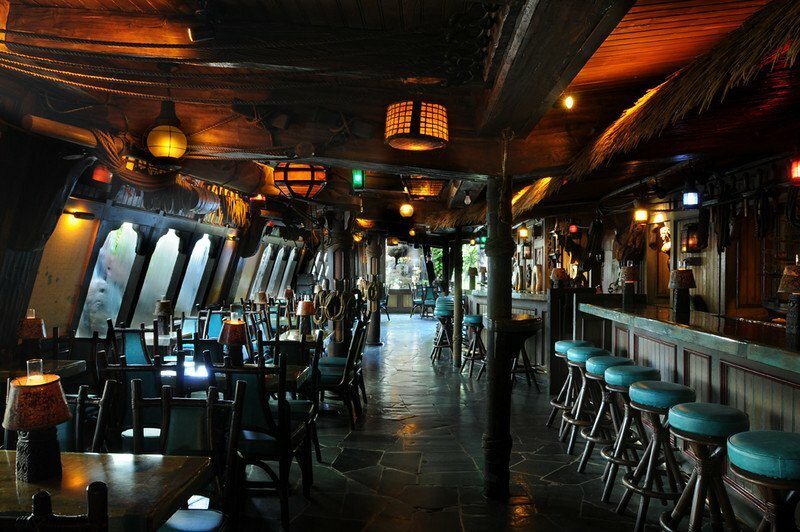 The entire place is an experience, from the tiki lounge built to look like a sunken ship to the mind-boggling collection of rums. This drink comes from the mind of Mariano Licudine. In the 1930s he was a bartender for Don the Beachcomber, learning many of the seminal tiki recipes in the process. After moving through various Beachcomber locations across the country and rising to #2 bartender, he was hired away by Jack and Bob Thornton, the money behind the Mai-Kai. Mariano was instrumental in every element of the Mai-Kai, from the design details to the drinks. His tenure at the Mai-Kai was so successful that he became something of a celebrity, appearing in papers, magazines and television programs across the country. 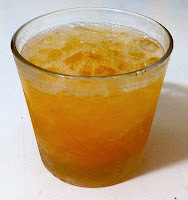 This particular drink was a Mariano secret for years, being served only to members of the Okole Maluna ("Bottoms Up") Society who had consumed every one of the 48 drinks on the Mai-Kai's menu. Combine all ingredients, add a handful of cracked ice and blend for 5 seconds, then pour into a chilled rocks glass full of cracked ice. The sip leads off with rich flavors of the rum and spicy Angostura bitters, followed closely behind by the tropical fruits flavor of the passionfruit syrup, orange juice and the honey sweetness, then last but not least, the snappy sour and bitter flavors of the lime and grapefruit juices. You should be careful with how much you dilute the drink through blending as it has a fairly hefty dose of rum and its good to be reminded how much alcohol you're consuming. Over cracked ice, the drink will mellow with time, becoming dangerously drinkable. 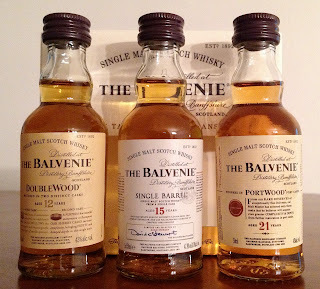 While I was up in Washington over the holidays, I was able to snag a couple of sets of Balvenie Mini 3-Packs. They contain minis of the 12 Year Doublewood, the 15 Year Single Barrel and the 21 Year Portwood. Given that the Portwood is usually a $150+ whisky, the whole set, at a bit under $20, costs less than a pour of the Portwood would go for at a bar. So this is a really excellent way to get a sense of what Balvenie has to offer. As the name implies, this whisky is aged in two different types of casks. It spends most of its life in traditional ex-bourbon casks and is then transferred to ex-sherry casks for a few months. I like what the Doublewood has to offer, there just isn't enough of it. While there's a rather nice set of flavors, the intensity just isn't enough. I feel like I really have to dig for some of them. And when the DW is $55 here in Portland, it's hard to justify this whisky when other double matured whiskies, like Glenmorangie Lasanta, are both more richly flavored and cheaper. I liked the Single Barrel a lot more. The intensity was kicked up a few notches and the spicy chocolate thing was really appealing. However, the fact that it felt a bit flat on its face after adding a few drops of water was really disappointing. I'm also not sure how I got so many flavors that reminded me of sherry given that the whisky is aged exclusively in "traditional oak", usually 250 L hogsheads, without the double maturation treatment. So while it was good, again, the experience doesn't really justify the rather steep $80 price tag here in Oregon. Again, there were some good things about the Portwood, but I wanted more of them. Actually, I want an awful lot more of them given the price tag. It's entirely possible that there are subtleties that I'm missing due to inexperience, but I just can't appreciate this as much as many other reviewers have. I'll gladly take the Glenmorangie Quinta Ruban, which costs a third of the Portwood. In conclusion, I generally like what Balvenie has to offer, just not at the prices they're charging. These are probably fantastic single malts if you want something on the lighter side, but I prefer my whiskies to have a bit more punch. To a degree, I feel like this is due to the fact that, with the exception of the Single Barrel (which was coincidentally my favorite), these are bottled at only 43% and chill filtrated. Chill filtration may be robbing these whiskies of a lot of their potential. As I've had plenty of whiskies that did just fine at 43%, I'm not sure if it's exactly deleterious, but I do wonder if that's why they don't seem to handle water too well. I'm open to having my mind changed, in case this was a fluke, but that won't happen unless someone decides to send me some more because I won't be spending any of my own money on Balvenie's products. However, if you haven't tried them before, hopefully you can get your hands of one of these mini 3-packs and decide for yourself whether these whiskies are worth the cost of entry. This is a very special rum, having been originally produced specifically for the bar Death & Co in NYC. Thanks to Haus Alpenz, it is generally available to the public as well. This rum is a blend from Trinidad, made by combining a number of different pot-still rums aged from 3 to 5 years in small oak casks. As an added bonus, this rum is bottled without chill filtration and at a very respectable 98-proof, which means that it is absolutely bursting with flavor. While I heard about this rum more than a year ago, the initial reviews, while mostly positive, made me somewhat wary. Thankfully I stumbled upon it finally being stocked at a local liquor store again and decided to take the plunge. On a number of occasions that I've tried this rum neat, it seems very closed at full strength. Almost nothing on the nose and a slightly lackluster palate. However, even the smallest amount of additional water makes this rum absolutely blossom with flavors. Maybe I've just become a little to used to high proof sippers, but I think this rum is just beautiful on its own. The balance and evolution of flavors is incredible, displaying bits from just about every style of rum out there in turn. To make an analogy, this is the Highland Park of the rum world. This is just a minor tweak on the classic Jasper's Jamaican. While the eponymous drink obviously calls for Jamaican rum, I think Scarlet Ibis fits into the mold almost perfectly. 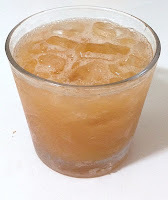 The cocktail retains the wonderful mocha and vanilla finish of the rum, hooking up with the allspice dram to give it a bit more pep. The honey syrup and lime play counterpoint, giving the drink both smoothness and zing at the same time. The higher proof of the Scarlet Ibis compared to most of the Jamaican rums on the market today (Smith & Cross and J. Wray excepted) also helps to buck it up. Overall, this is a very pleasant little drink. This is an expression which was a limited bottling from Glenfiddich that is becoming harder to find now that it is no longer one being shipped to the U.S. This whisky was in a sense a re-release of the Distillery Edition bottled in the 1990s when it was a fairly radical departure from the norm for scotch whisky. Similar to their normal 15 year bottling, the malts going into it were aged in both ex-bourbon and ex-sherry casks made from both American and European oak for 15 years then blended together. The difference comes from using a more standard aging and blended system (the normal Glenfiddich 15 is aged using a solera system) and the fact that it is brought down from cask strength to a still very healthy 102-proof without chill filtration. This whisky took me a little while to figure out because the vegetal peat flavors are a bit of a new thing to me. At first it seemed to me like a peculiar addition to an otherwise slightly standard array of lightly sherried Speyside single malt flavors. However once I figured out what I was tasting, I realized that it made a very nice counterpoint to the richer, sweeter flavors imparted by its long time in barrels. I was lucky enough to find a bottle of this whisky on sale for only $30 (Thanks, WSLCB!). Even at the more standard price of $60 it's still a pretty good deal for a 15-Year whisky, as those can easily run into the $70-80 range. Additionally, the higher proof here means that it will probably last a bit longer as it encourages you to drink just a little more slowly without having too much of a burn. I would definitely recommend this whisky if you want a very solid scotch with enough strength and engaging flavors to keep you occupied. As I mentioned at the beginning of the post, it's not something that will be easy to find in America any time soon, so get some while you still can.